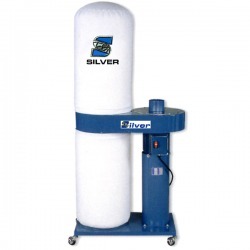 Silver SDM-900 01a portable 1hp dust collector, 650cfm, 10" impeller, 350mm drum diameter, gross weight 79 lbs. CALL FOR ADDITIONAL SPECS AND PRICING! 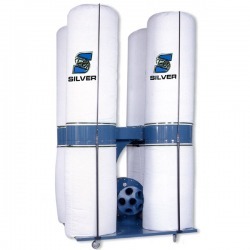 Silver SDM-515 02A 2hp portable dust collector, 1172 cfm, 12" impeller, 500mm drum diameter, gross weight 139 lbs. CALL FOR ADDITIONAL SPECS AND PRICING! 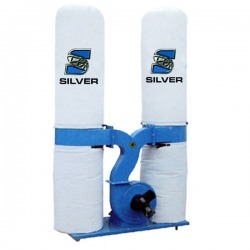 Silver SDM-525B 03A portable 3 hp dust collector, 1862 cfm, drum diameter is 500 mm, gross weight 180lbs. CALL FOR ADDITIONAL SPECS AND PRICING! 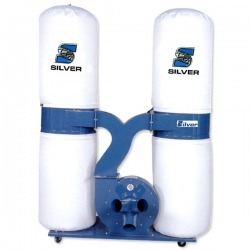 Silver SDM-425B 04A portable 4hp dust collector, 4hp dust collection motor, 1500 cfm, (3) 4" dust inlet openings, 300mm fan diameter. CALL FOR ADDITIONAL SPECS AND PRICING! 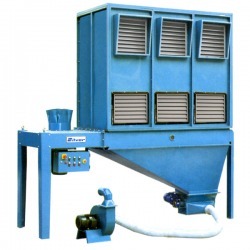 Silver SDM-550B 05A 5hp portable dust collector, 5hp dust collection motor, 2940cfm, (4) 4" dust inlet openings, fan diameter is 350mm. CALL FOR ADDITIONAL SPECS AND PRICING! 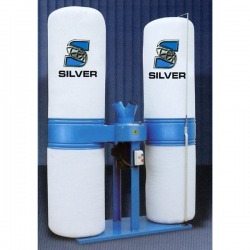 Silver SDM-575DS 06A portable 10hp dust collector, 10 hp dust collection motor, 5260 cfm, 17" impeller diameter, drum diameter is 660mm. Gross weight is 925 lbs. CALL FOR ADDITIONAL SPECS AND PRICING! 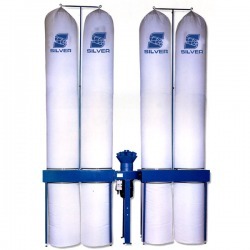 Silver SDM-735DS 10 hp dust collector, 10 hp dust collection motor, 5,360 cfm, 17" impeller diameter, bag volume is 58 cu ft, drum diameter is 660mm, gross weight is 770lbs. CALL FOR ADDITIONAL SPECS AND PRICING! 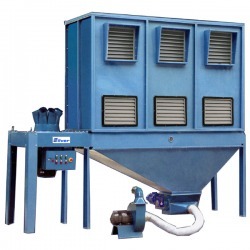 Silver SDM-8010B 07A 10hp dust collector, 10hp dust collection motor, 2hp outfeed air blower motor, 1hp outfeeder power, 5000 cfm, (6) 5" dust inlet openings, Fan diameter is 600mm, (36) 150mm x 1600mm filter bags, Overall machine size is 134" x 45" x 133", Net weight is 2200 lbs. CALL FOR ADDITIONAL SPECS AND PRICING! 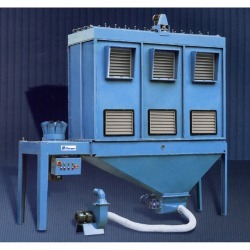 Silver SDM-1215B 07B 15 hp dust collector, 15hp dust collection motor, 3hp outfeed air blower motor, 2hp outfeeder motor, 7100 cfm, (8) 5" dust inlet openings, 700mm fan diameter, comes with (48) 150mm x 1600mm filter bags, overall machine size is 165" x 45" x133", net weight is 4200 lbs. CALL FOR ADDITIONAL SPECS AND PRICING! 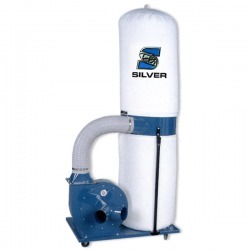 Silver SDM-1215A0 07C 15hp industrial dust collector, 15hp dust collection motor, 5hp outfeed air blower motor and 2hp outfeeder motor and 3/4 hp bag shaker motor, 7,100 cfm, (8) 5" dust inlet openings, fam diameter is 700mm, comes with (48) 150mm x 1600mm filter bags. Overall dimensions are 165" x 45" x 146". Net weight is 4,400 lbs. CALL FOR ADDITIONAL SPECS AND PRICING!